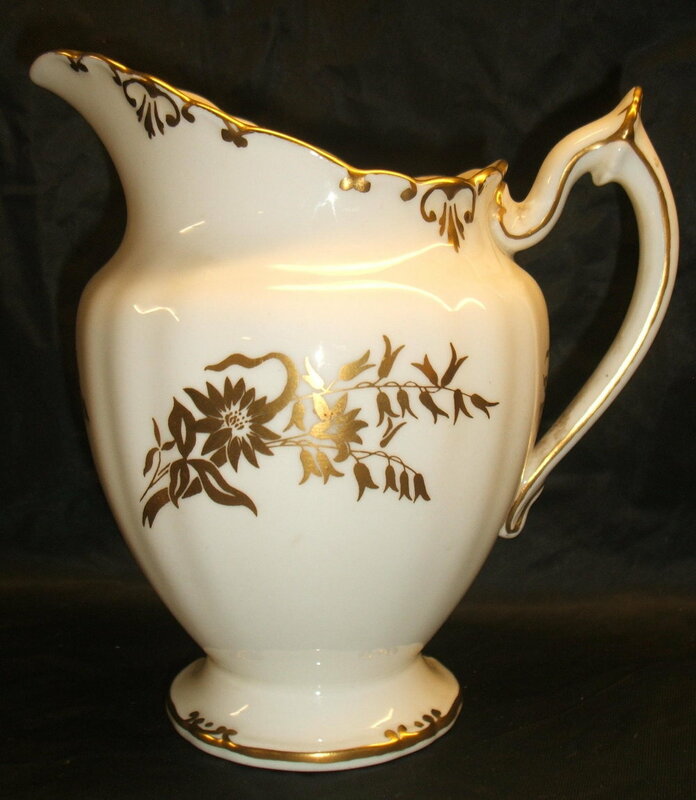 A1000 – Coffee Pot, Cup and Saucer, Cream and Sugar in the Burford shape with “Melody” litho pattern. The roses are not hand coloured in this pattern. A1001 – Tea Cream, Teacup and Saucer and Soup bowl in the Gadroon shape with “Melody” litho pattern. A1003 – A1009 A series of service plates in the Edale shape with Ellis centres. Above are the cobalt, maroon, green and salmon versions. The last image is of a plate with a golden fawn ground which is not listed in the pattern book. Described as having a sanded gold and brown printed border below the rim, this does not appear in any of these examples. I presume that it was decided that the plates looked better with just a line and dentil. A1003 was gilt by Constance Clark. Do see her blog page. A1010 – Burford shape plate with the Cotswold (Capper Rataud) litho border. Gold edge. This is a version of A615 “Flowered Border” but on the Burford shape. 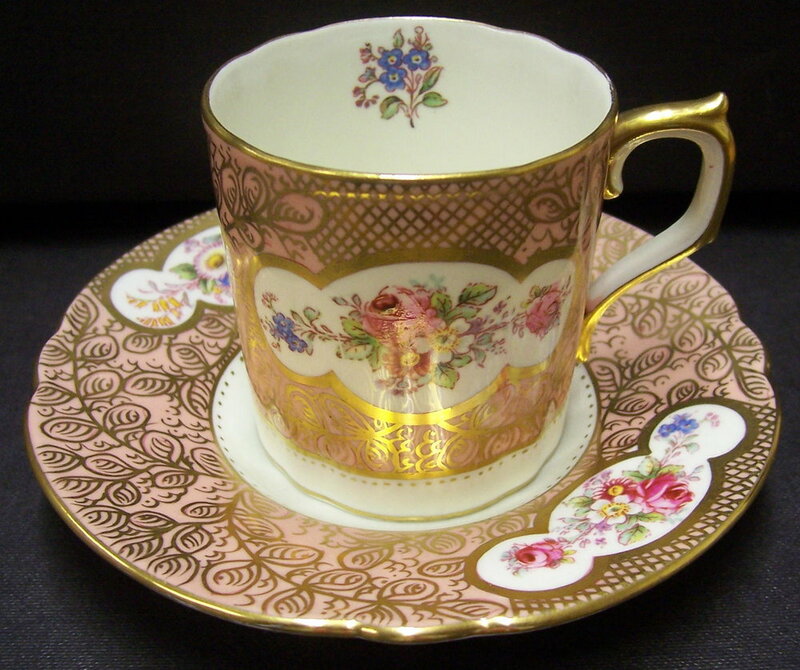 A1012 – “Windsor” Burford shape teacup and saucer with posie litho sprays scattered over the embossment. The roses are hand painted. Very easily confused with A945 “Ashby” which has a single posie spray. A1017 – A Vine shape plate with scattered posie sprays as “Windsor”. The roses are also hand painted and there is a gold edge. A1018 – A1062 A series of eleven different patterns with four ground variations – cobalt, maroon, Montreal green and salmon. These mostly appear on teacups and saucers in the Elizabeth shape or on coffee cups and saucers in the Chelsea/Ely shape. I have also seen bread and butter plates and a teapot. Most of these have been acquired from the US or Canada, and I suspect therefore that this range was aimed returning servicemen. Decorated ware was not readily available in the UK because of the Board of Trade restrictions on sales in the home market which ended in 1952. A1066 – Teacup and saucer in the Heraldic shape and the pattern is also entitled “Heraldic” It was produced in white and gold and in three colour variations, blue, red and green. It was available in both dinner ware and tea ware. Personal monograms or crests could be added (see UK Commissions for examples). A1066 Variant – White and gold Heraldic with the addition of a Garnett centre and St James gold sprays. A1067 – (Mazarine) blue version. A1067 Variant – Flower spray added. A1068 – Heraldic Maroon. The gilding on the embossment took about three hours to apply by hand on a single plate - (Betty Wherry 2017). It is therefore difficult to see how this pattern could now be produced commercially. A1068 Variants – The first example above has an Ellis centre. The next two images show different Garnett centres with St James gold sprays. A1069 – (Sian) green version of Heraldic. A1070 - Posie with scattered flower sprays as A1012 “Windsor” but on the Heraldic shape. A1070 Variant – A version of A1070 but with Ellis sprays. In the version shown in the second image the flower sprays are asymmetrical. A1075 “Regency”. Silver shape white and gold. The two variants shown have Ellis sprays with the second including St James gold sprays around the rim. 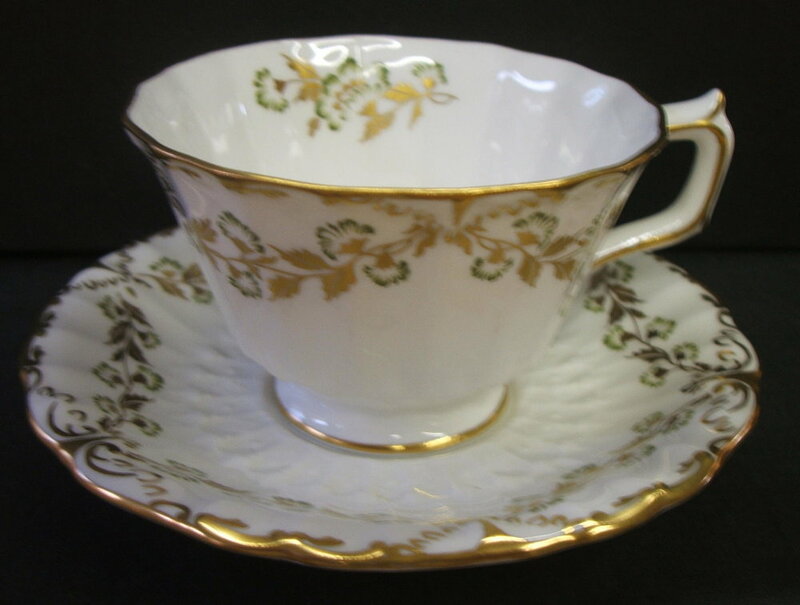 A1076 – Burford shape teacup and saucer. The pattern is printed in grey. The roses are hand enamelled in pink and the flowers and centres in blue green. A1078 – Listed under the Portman shape this version is in the Plain shape. Red Star of Eden in the centre with thick gold band and line to the rim, and line at the shoulder. A1079 “Golden Scroll” – Ely shape plate with printed and hand gilt scrolls. A1081 – “Royal Bouquet” Shown as a series of small flower sprays arranged in panels around the rim of a plate, I have yet to find an example, but the same sprays appear on the above image of the bottle opener. This pattern was clearly suited to small items, and so far I have only seen it on china handled cutlery. The roses were hand enamelled. A1082 “Claremont” – The first example of a piece in the Boston shape. Teacup and saucer with pattern printed in grey and then enamelled in blue green. Leaves and spots in silver. Ungilt. A note in the pattern book indicates that the pattern was subsequently applied as a lithograph. 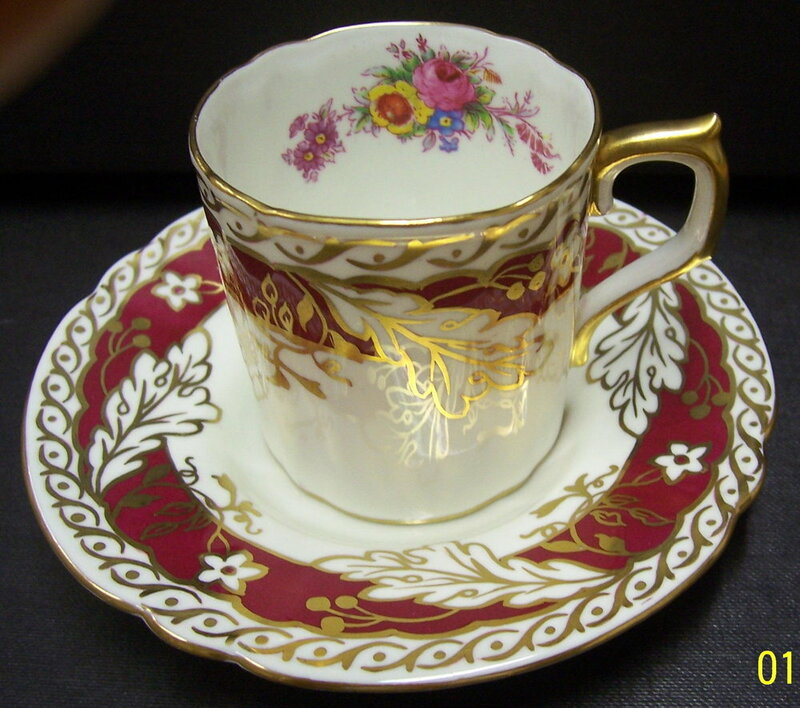 A1090 -“Paradise Maroon” – Heraldic shape cup and saucer. The pattern was printed in grey. The birds and flowers were then painted to prevent the ground from adhering in these areas. The maroon ground was then applied up to the embossment and the pattern overprinted in raised colour. The embossment was gilt by hand. 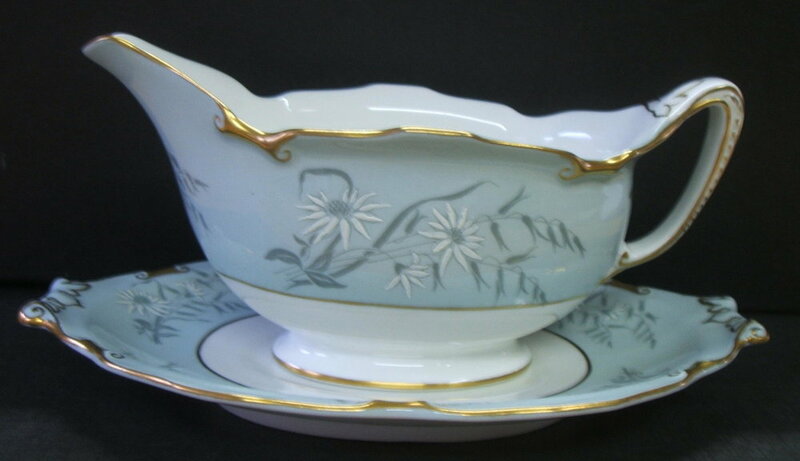 A1091 – Boston shape cup and saucer with Derby Star of Eden centre. The panels and centre are in turquoise. Litho star centre with printed edge pattern. Gold edge hand gilt. A1092 – “Countess” – Boston shape plate with blue panels on rim. Ellis centre with rose painted. Gold printed rim pattern and edge hand gilt. A1093 – Boston shape plate. It has a gold printed border pattern known as “Magdalena”, a pattern (number 766) which dates back to C1880. A1094 – Boston shape with litho gold "Gloria" strawberry sprays on rim and gold spray in centre. A1100 – “Bali” Here are shown versions in the Ely/Chelsea, Queen Ann and Boston shapes. Originally entered into the book as “Formosa” this name was crossed out. The blue was printed and the rest of the pattern lithographed in red and gilt. A1101 – As A1078 but with a turquoise coloured centre. A1102 – As A1092 “Countess” but without the Ellis centre. A1103 – “Astoria” Boston shape with printed bead pattern, handspotted in blue green. No gilding to edge. This plate is not marked as such but fits the description. It is crossed out in the pattern book and marked as “withdrawn”. A1104 – Boston shape. “Gloria” pattern printed in gold with raised gold spots. Pattern and edge gilt by hand. A1107 – “Rougemont” A revival of the “Magdalena” pattern. Litho print and gold edge. The first two images show a coffee pot and sugar box in the Boston shape followed by a breakfast cup and saucer in the Queen Ann shape, an Edinburgh shape coffee cup and saucer and a teacup and saucer in the Duesbury shape. A1108 – Boston shape with printed gold “Gloria” pattern and beading at shoulder. A1109 – “Devonshire”. Silver shape teacup and saucer, dinner plate, teapot and sugar box. Printed gold sprays hand enamelled in pink and blue. Hand gilt edge. A1111 – Heraldic shape. Exotic birds centre printed in purple and then hand enamelled and gilt. A1112 – “Heraldic Celeste”. 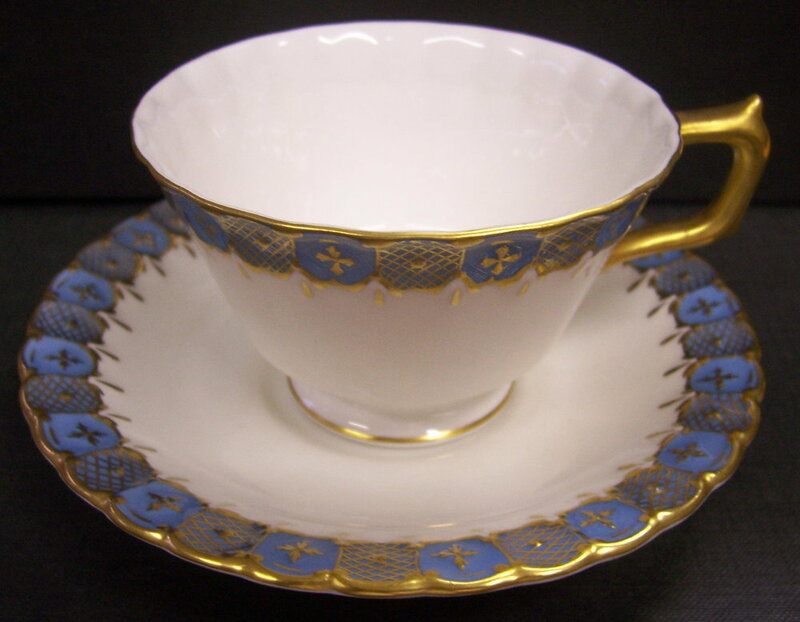 Heraldic shape teacup and saucer with celeste ground to rim. Hand gilt. A1112 Variant – As above but with the addition of a Garnett centre. A1113 – Silver shape soup bowl with printed “Magdalena Border” and Ellis centre. Listed in the pattern book as being ungilt on the edge with only a dash on the handle, this example is gilt. 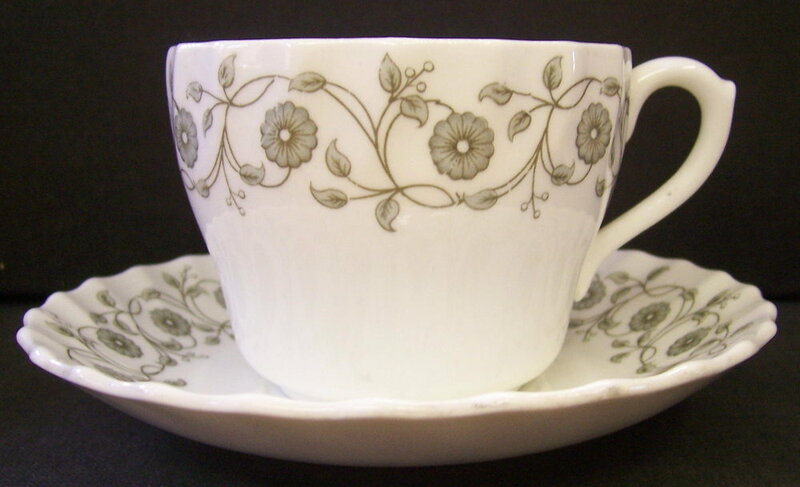 A1114 “Sandby” - Silver shape teacup and saucer with grey printed pattern. Hand gilt. A1116 – As A1114 but with the addition of a turquoise ground. A1120 – “Pinxton Roses”. Silver shape teacup and saucer. A1121 – Boston shape version of A378 without the celadon ground. 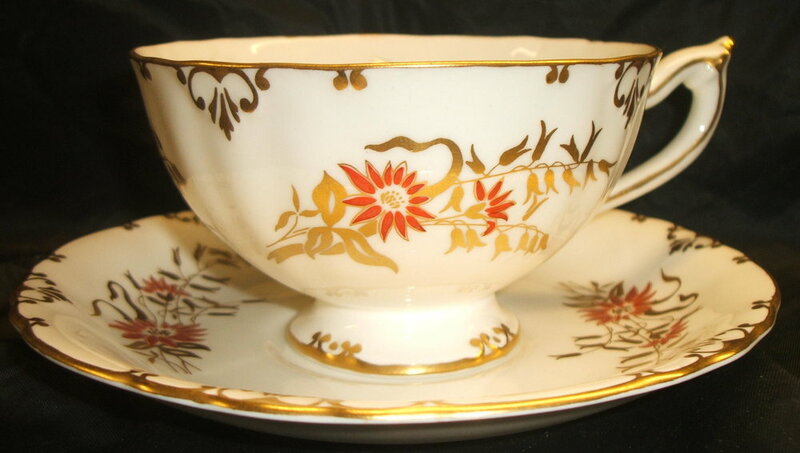 A1122 – Boston shape teacup and saucer with a “Magdalena” border. The pattern book lists a gold edge which is lacking in this example. A1123 – Heraldic shape. Ground colour (here celeste) to embossment, with printed paradise birds in gold. A1123 – As above but with celadon ground. 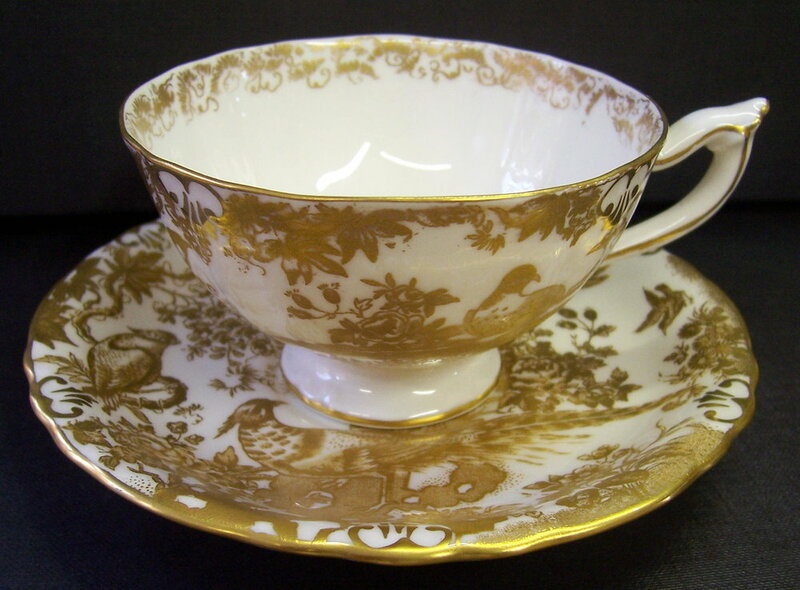 A1124 – Heraldic shape teacup and saucer. Printed gold sprays hand enamelled in blue-green. Hand gilt. A1125 – Heraldic shape with ivory ground all over except embossment. Printed gold sprays. Hand enamelled and gilt. A1126 – Heraldic shape. Version of A1124 with salmon pink ground except the embossment. 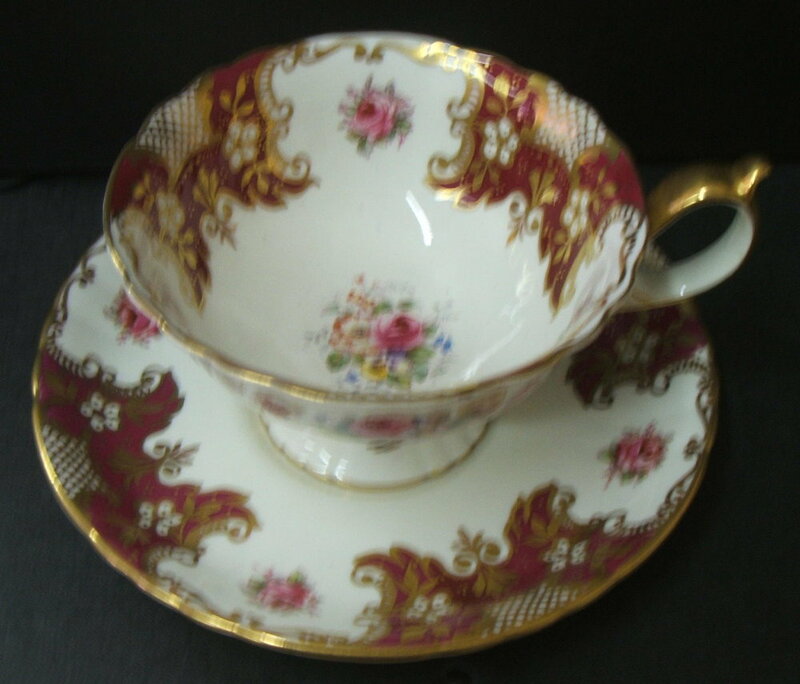 A1127 – "Lombardy" Royal shape teacup and saucer. Turquoise enamel dots, gold edge and dentil shoulder. A1127 Lombardy Variant – A version with an Ellis centre. A1131 – Royal Shape. A series of six printed and then hand painted hunting scenes with a “Lombardy” border. A1133 – As A1131 but with dots in red enamel. This example has a highland cattle scene. 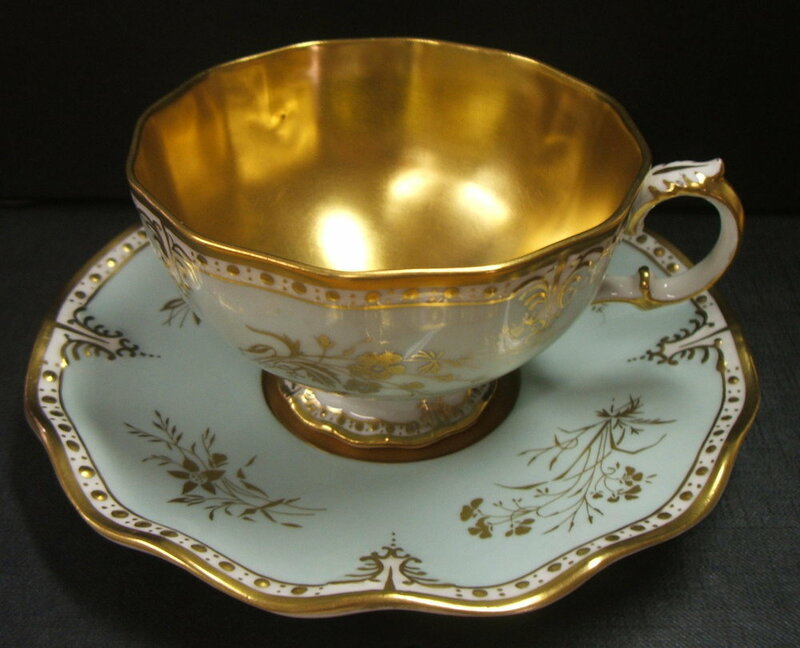 A1136 – Silver shape teacup and saucer. Turquoise ground, Garnett centre. Gold edge and line in centre. A1136 Variant – As above but Ellis centre not Garnett. A1137 – Silver shape teacup and saucer. Turquoise ground with addition of Claremont pattern enamelled in white. Gold edge and line in centre. A1138 – As A1137 but with shell pink ground. A1139 “Alpine” Silver shape. A sauce boat and stand shown here. Turquoise ground with flowers printed in grey and then enamelled in white. Gold edge and line. A1140 “Denver” – As A1139 but with a pink ground. 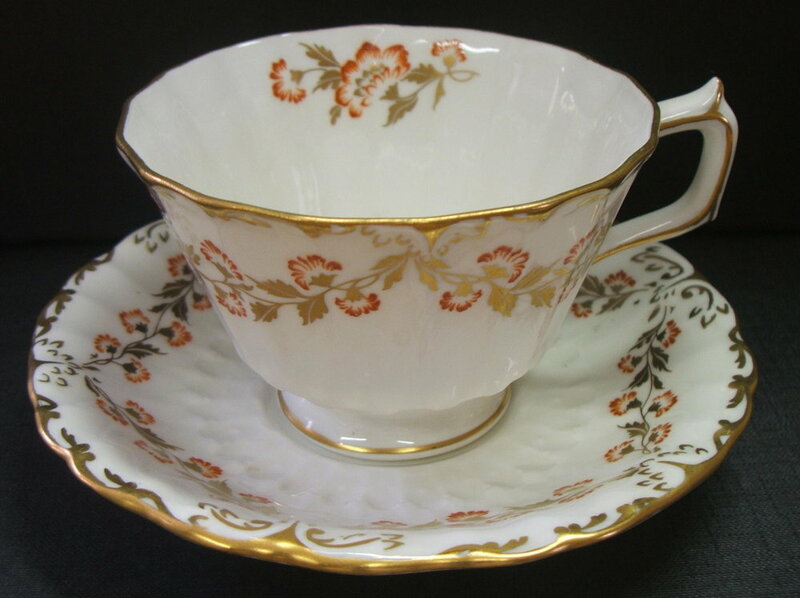 A1144 “Normandie” – Royal shape teacup and saucer. Printed gold sprays enamelled in blue-green with blue green dots. Gilt edge with dots. A1145 “Royal St James” - Royal shape plate. As A1144 but without the blue-green enamel. A1146 Boston shape. Printed gold border to half rim depth. Turquoise ground and gold edge. A1150 - Boston shape with pink ground over printed with "Wilmot" pattern. Gold line at centre and edge. 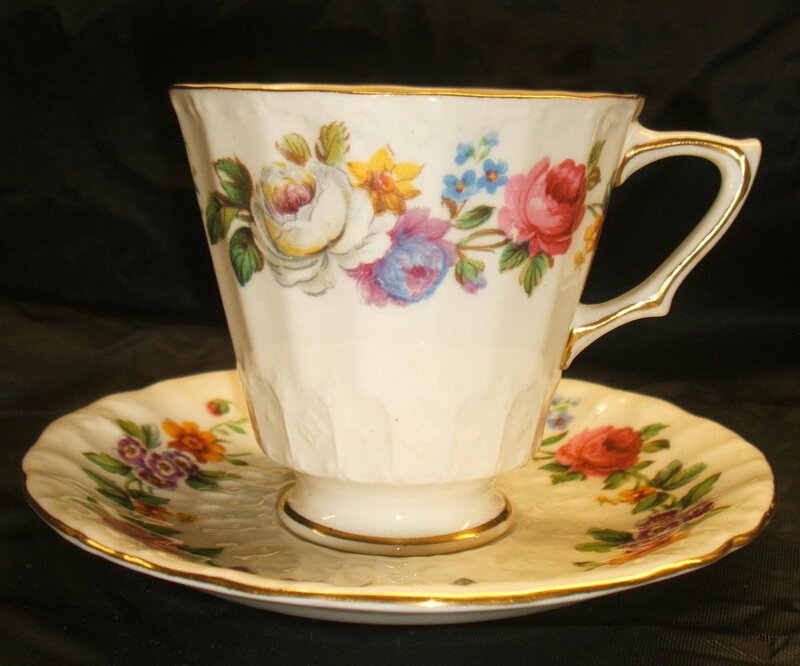 A1155 “Royal Pinxton Roses” Royal shape teacup and saucer with litho rose sprays. Hand gilt as A1144. Still in production today. A1156 – Boston shape teacup and saucer with “Wilmot” pattern printed in blue on glaze. No gold edge. A1158 – Boston shape with Pinxton Rose centre. Shell pink ground to half rim. Gold sprays on rim. Gold edge and line. A1159 – Heraldic shape. Maroon ground below embossment to shoulder. Gold line on shoulder. A1160 – “Diana” - Boston shape teacup and saucer with “Diana” pattern printed in grey and enamelled in turquoise. Ungilt. A1160 Variant – Version of “Diana” but enamelled in yellow-green. 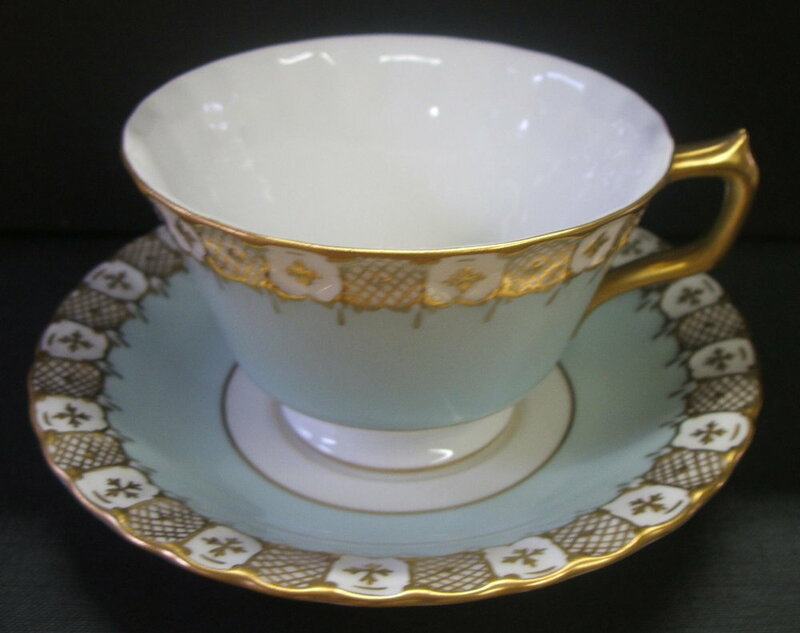 A1166 – “Lancelot” Heraldic shape coffee cup and saucer with turquoise enamel spots. Lightly gilt embossment - Compare it with that to A1167 below. A1167 – Heraldic shape teacup and saucer, teapot, cream and sugar box. As A1159 but with a turquoise ground. A1169 – “Exeter”. The first image shows a plate in the plain shape, the second a cup and saucer in the Queen Ann shape. Gold printed pattern based, it would appear, on the centre of “Magdalena”. A1170 – Version of “Exeter” with yellow flower heads and yellow on embossment. A1171 – As A1170 but purple flower heads and purple on embossment. A1172 – White and gold version of the “Paradise” pattern, but on the Royal shape. A1182 – “Blue Stratford” Plain shape with pattern printed in blue. A1184 “Woodland Violets” Unique factory mark with the pattern name in purple and with the additional text “By Wm PEGG CIRCA A.D. 1799”. The small size flower sprays are suited to the smaller fancy items. Here is shown a Cairns tray. A1186 “Golden Glades” - Royal shape and here shown as a sugar box. Gold spots to the edge with alpine sprays jewelled in turquoise. 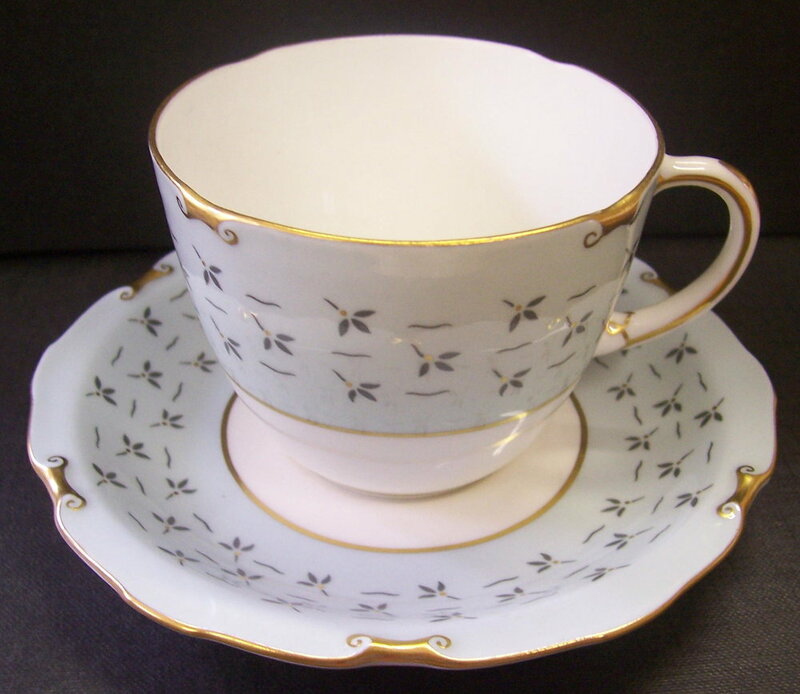 A1187 – Boston shape teacup and saucer with the Wilmot pattern printed in grey. Ungilt. 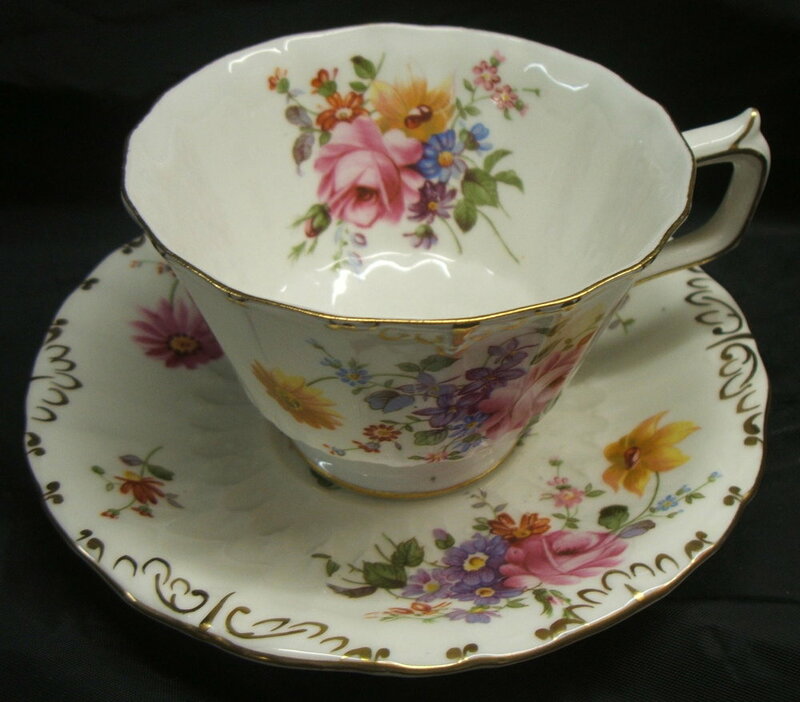 A1188 – Surrey shape teacup and saucer. (Mazarine) Blue panels. Gold vermicelli litho with gold and brown roses. Ellis centre. Entered into the pattern book on the 18th October 1958. A1190 – Silver grey ground to rim with white enamelled gold sprays. Gold edge and shoulder line. Entered 20/10/1958. A1191 – Silver grey ground to rim. Gold Lily ¼” from edge. Lily centre. Gold edge and shoulder line. A version of A378. Entered 03/11/1958. 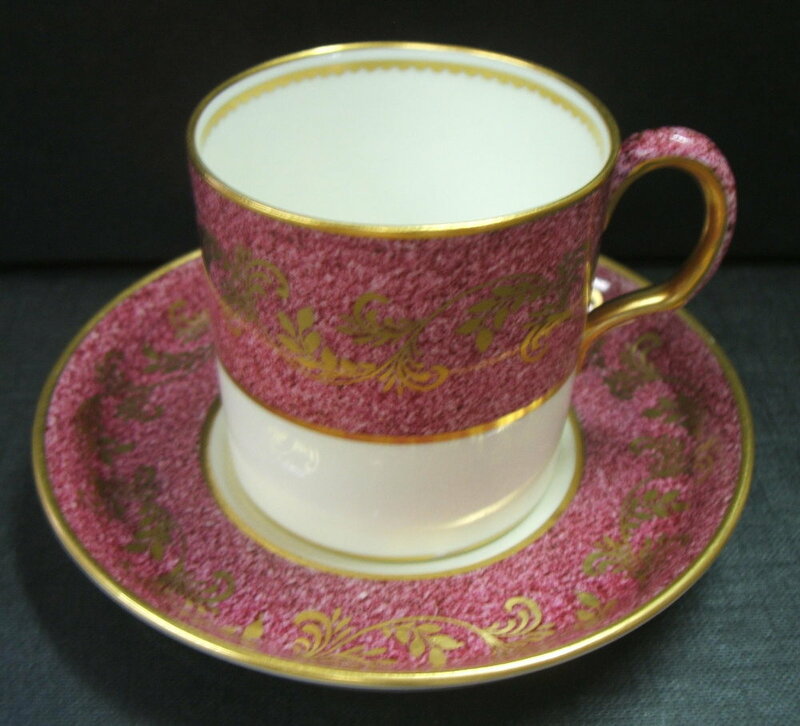 A1197 – Edinburgh shape coffee cup and saucer. Pink rose ground with “Diana” pattern on top. 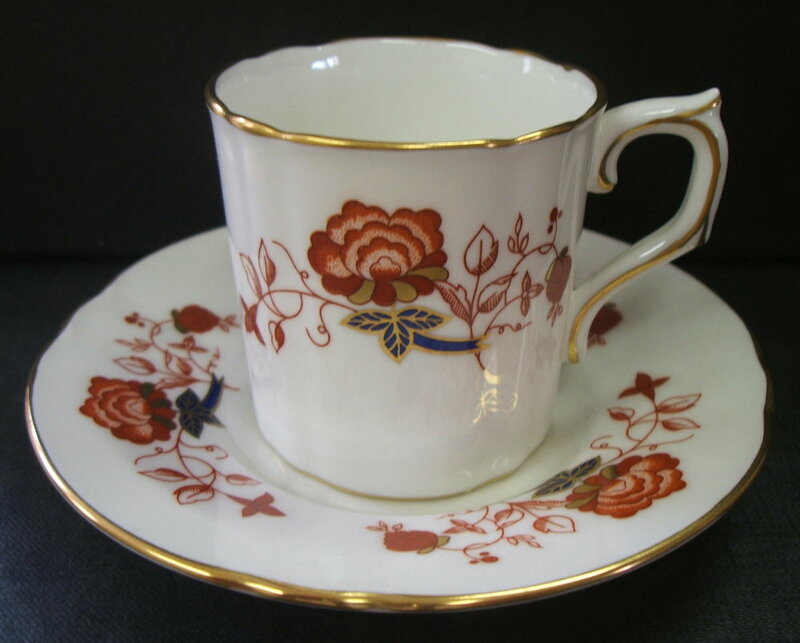 A1208 – Coffee cup and saucer in the Royal shape. Powder pink ground and Ellis centre. 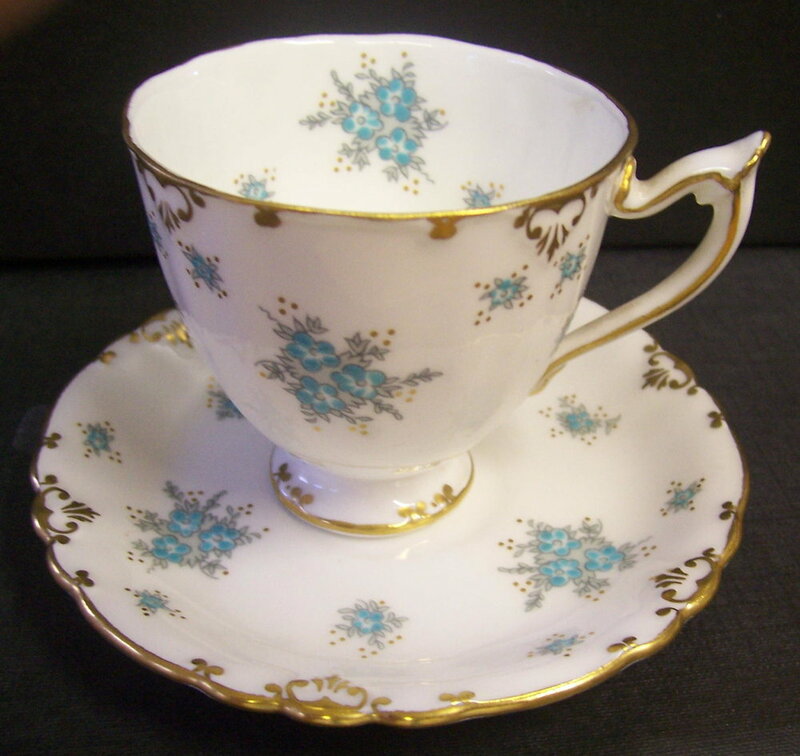 A1210 – Teacup and saucer in the Royal shape with powder blue ground and Ellis centre. A1212 – Exactly as A1208 but Teacup and not coffee cup. For some reason in this section tea and coffee cups in the same pattern were given separate pattern numbers. A1213 – Heraldic shape. Bird of Paradise on a selenium red ground. Hand gilt. Entered 10/02/1959. A1216 – “Kensington” Beaufort shape. Grey printed sprays enamelled in turquoise. Entered 16/09/1959. A1217 – “Norfolk” – Beaufort shape. Brown printed sprays enamelled in selenium red. Entered 17/09/1959. A1219 – “St Claire” - Beaufort shape. Gold printed sprays enamelled in turquoise. A1219 Variant – Version of “St Claire” but with an Ellis centre. A1220 – “Delphine” Beaufort shape. A litho pattern with flowers and sprigs hand enamelled. Hand gilt. Entered 14/01/1959. A1220 Delphine Variant – Version with an Ellis centre. 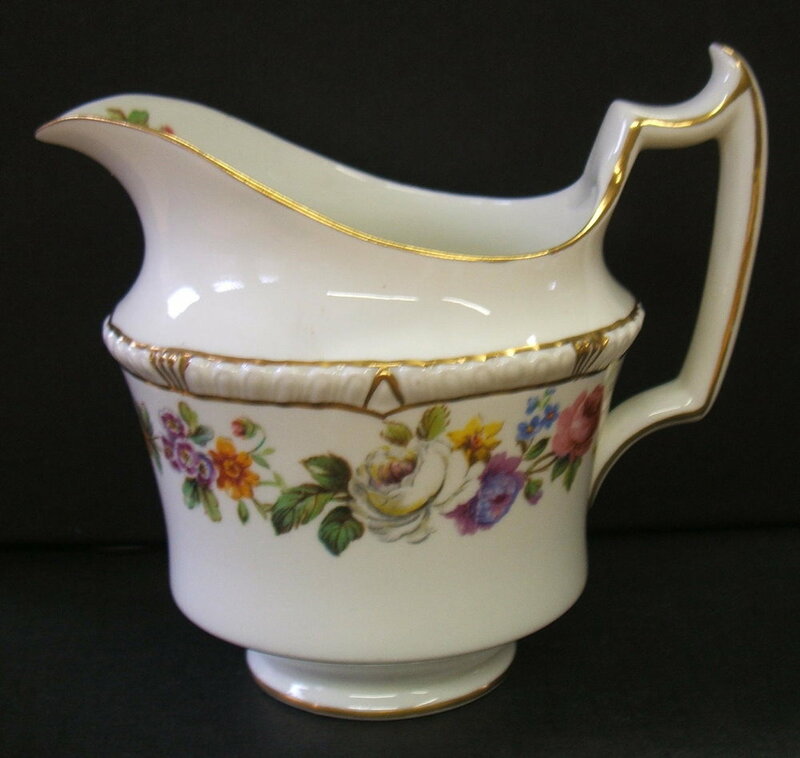 I have also seen versions of this pattern with the flowers enamelled in pink or yellow and with the factory marks scratched through as a second, presumably trial pieces. 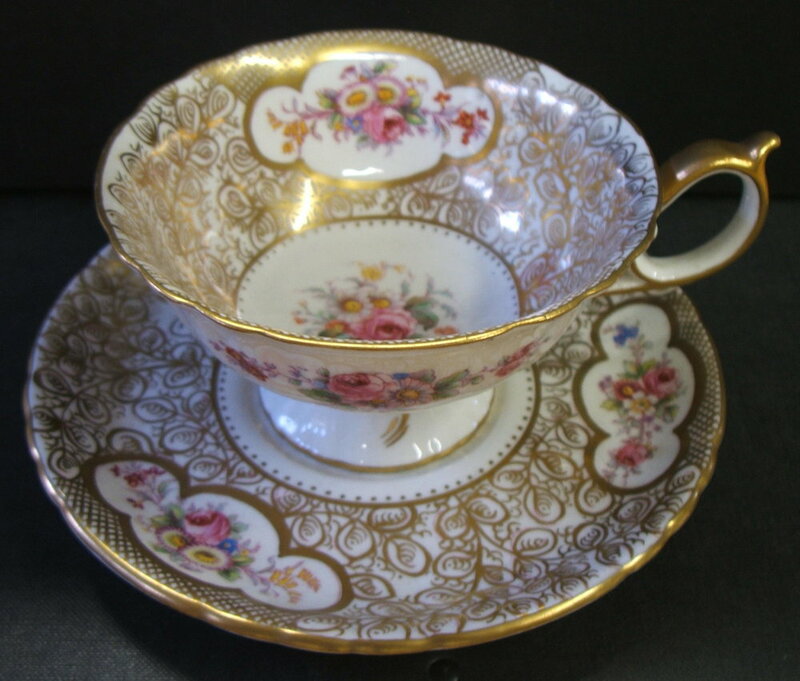 A1221 – “Royal Splendour” Teacups and saucers in the Royal shape. There are six different grounds, celadon, cobalt, Duesbury green, maroon, moss green and salmon. Solid gold linings to the cups. The celadon and cobalt versions are shown above. A1221 – “Royal Splendour” – maroon, moss green and salmon versions. 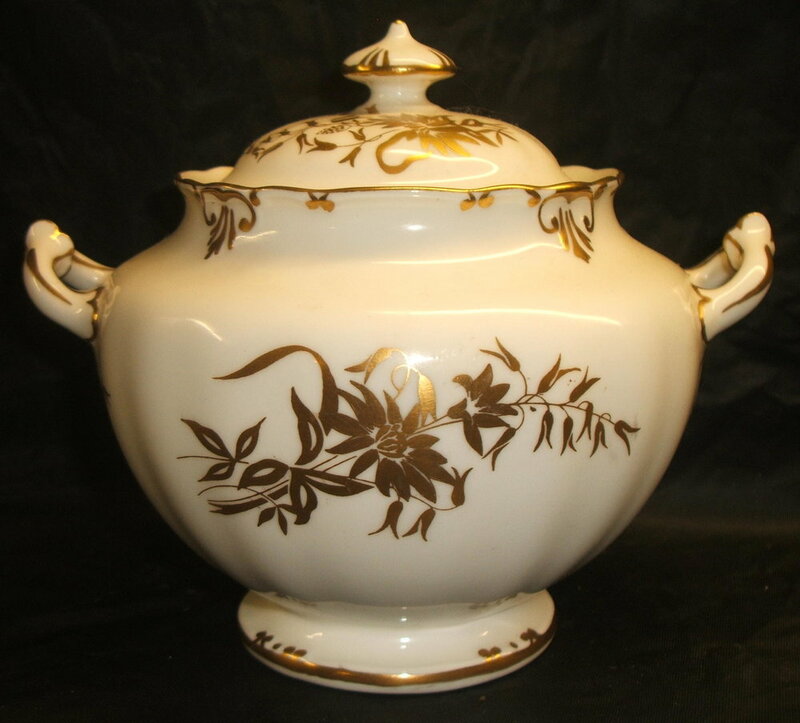 A1222 – “Marquis” – Beaufort shape sugar box and tea cream. As “St Claire” but sprays filled in gold. Gold line below shoulder. Entered 17/09/1959. 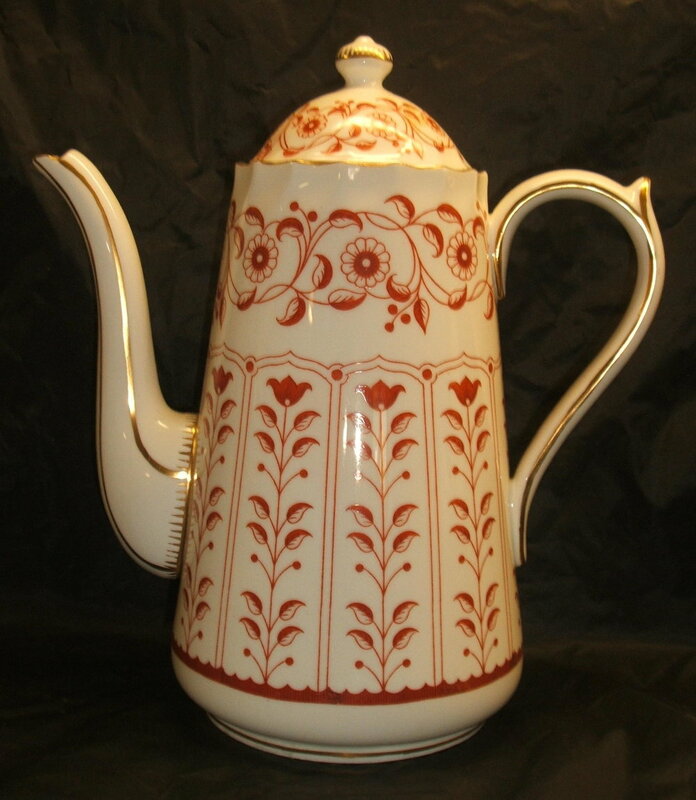 A1223 “Sherringham” Beaufort shape coffee pot and teacup and saucer (low) shown above. As “St Claire” but flowers enamelled in selenium red. Entered 17/09/1959. A1224 – “Newark” – Beaufort shape. As St Claire but flowers enamelled in blue. Easily confused with A1244 “Bordeaux” , but “Bordeaux” is in the Ely/Chelsea shape. Entered 18/09/1959. A1225 “Royal Antoinette” – Litho pattern on Royal shape. Entered 06/02/1959. Still in production today. A1225 Variant – A version of “Royal Antoinette” but with an Ellis centre. A1227 “Clarendon” – Beaufort shape white and gold with no patterns. Entered 18/09/1959. A1227 Variant – Two Beaufort shape plates, the first with gold St James sprays and an Ellis centre, the second with Ellis sprays to both rim and centre. A1229 “Brittany” – New Plain shape. Originally printed in pink with berries enamelled in green and selenium red, it appears that subsequently a litho was used as supplied by Johnson Matthey and Co. Solid edge and shoulder line. Hand gilt. Entered 18/09/1959. 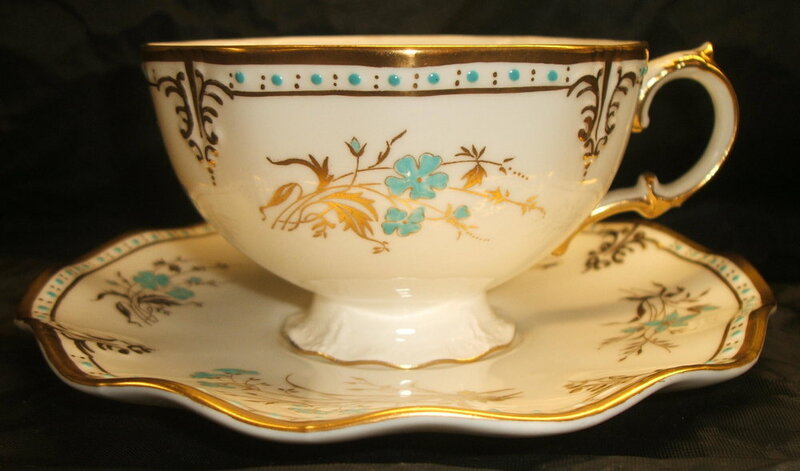 A1230 “Cherbourg” – Teacup and saucer in the new Plain shape. A litho by Johnson Matthey enamelled in selenium red. Gold Edge. Entered 18/02/60. A1231 – “Honiton” Listed as in the New Plain shape but here it appears as a coffee pot in what I believe to be the Dublin shape. As “Cherbourg”, but enamelled in blue. Entered 18/02/1960. A1232 “Autumn Rose” – Beaufort Shape. Litho flower spray. Line at shoulder and hand gilt. A1233 – “Tiverton” New Plain shape. As “Cherbourg” but enamelled in turquoise. Entered 18/02/1960. A1234 - Version of "Cherbourg", "Honiton" and "Tiverton" but with maroon enamel. Marked in the pattern book as "Versailles" the name was subsequently crossed out, probably when it was realised that the name had already been used for pattern A1218. A1235 – “Gold Aves”. Printed Paradise pattern on Beaufort shape. Also produced in the Ely/Chelsea shape. Still in production today. A1236 – “Red Derby Panel”. Ely shape. Johnson Matthey & Co red and gold litho pattern designed by Phillip Robinson. Gold edge and shoulder line. Entered 12/08/1960. A1237 – “Green Derby Panel”. Ely shape. Johnson Matthey & Co green and gold litho pattern designed by Phillip Robinson. Gold edge and shoulder line. Entered 12/08/1960. Still in production today. Princess Anne and Captain Mark Phillips chose this pattern as a wedding present and were duly presented with a coffee and dinner service by the British Ceramic Federation. A report of the gift with pictures appeared in the Derby Evening Telegraph of Monday October 22nd 1973. 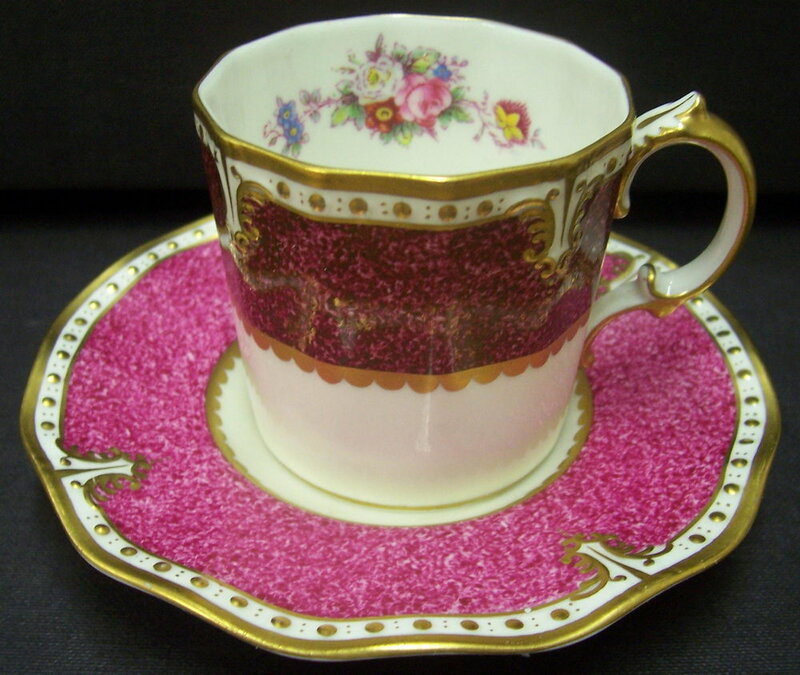 A1238 “Bourbonnais” – Teacup and saucer. A version of A1236 but on the Burford shape. Entered 15/02/1961. 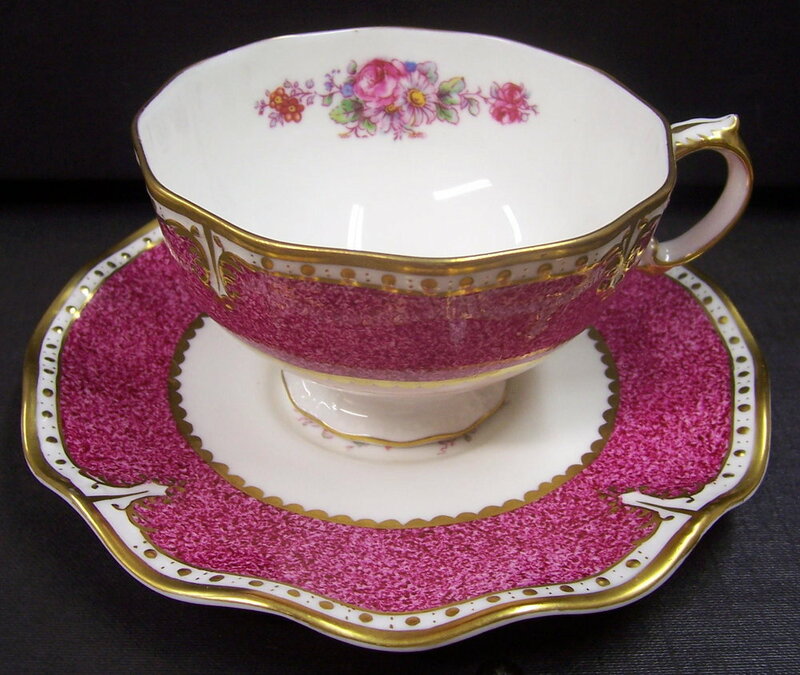 A1239 “Touraine” – Teacup and saucer. A version of A1237 but on the Burford shape. Entered 15/02/1961. A1240 “Morlaix” A version of A1238 but on the Surrey shape. A1241 “Rheims” As A1239 but on the Surrey shape. Entered 04/07/1961. 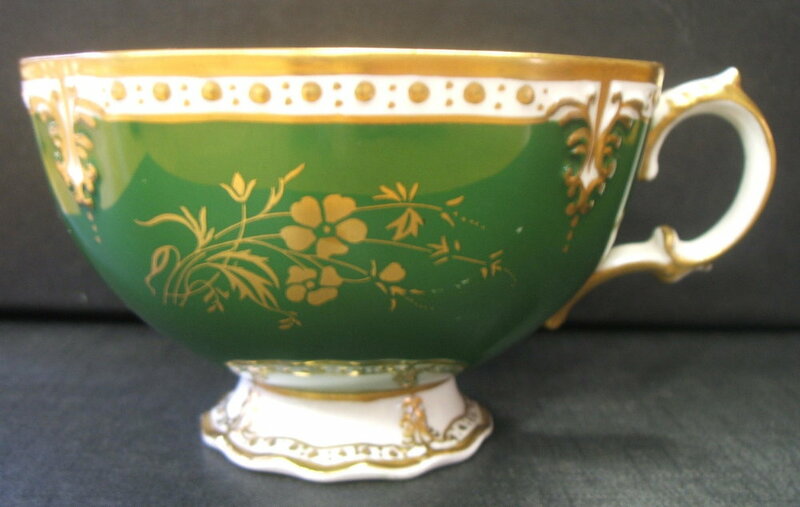 A1242 – As “Bourbonnais” but on heraldic dinnerware. A1243 - As “Touraine” but on heraldic dinnerware. A1244 “Bordeaux”. Ely/Chelsea shape teacup and saucer. A version of A1224 “Newark” but on the Chelsea shape. 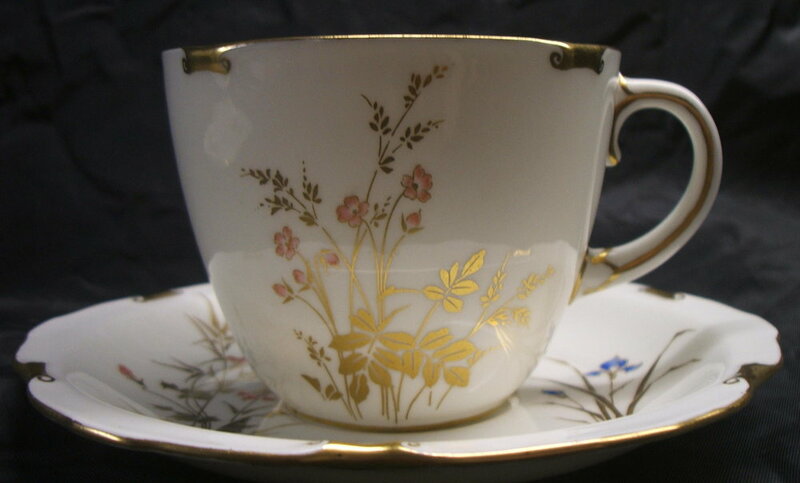 A1245 “Harvest Poppy” - Teacup and saucer in the Dublin shape. Litho flower spray and border with gold edge and foot line. A1246 “Blue Pimpernel” – Listed as being in the Dublin shape the example above is in the Duesbury shape. Litho sprays with gold dentil edge.